Despite the dull mizzly weather, aware that the first lorry load of steel had already been delivered last week, it was with keen anticipation and some excitement that I made my usual Wednesday visit to Tankerville Terrace today. And I was not disappointed. Even from the road, through the yellowing, autumn leaves there were tantalising glimpses of silvery steel against the gloomy, grey sky. 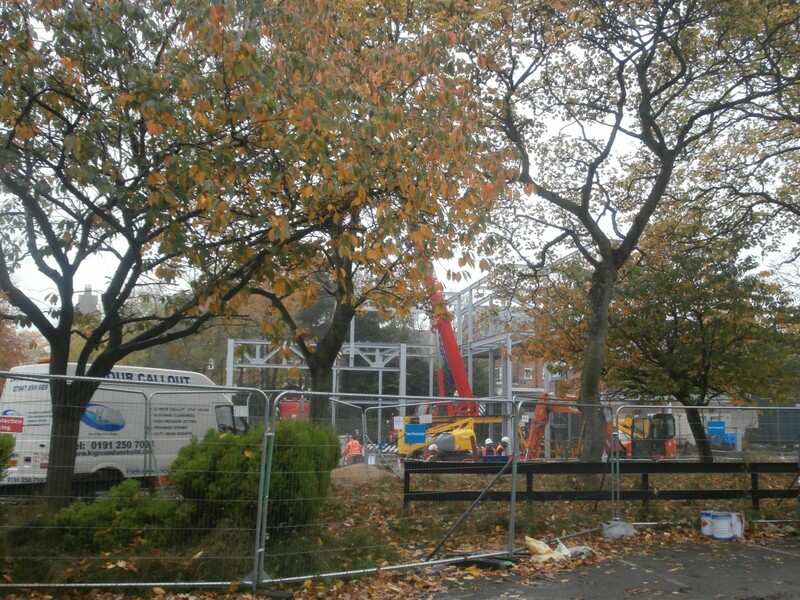 The first pieces of steelwork are just visible behind the trees. My regular as clockwork Wednesday visits, camera in hand, were no longer unusual events for the industrious yet also very friendly workforce on site. Particularly welcoming and helpful was Wates’ Site Gateman, Peter Wilson, who, with the permission of Project Manager Nick White, was now allowing me inside the gates at a safe-distance from all activity to enable me to get better shots. This was a real bonus now as the steel structure would have remained partly obscured by the trees from behind the gate – the first time the leafiness of the Church High site would have proved a problem! My first unobstructed view of the developing steel structure with the Church High Sports Hall clearly visible behind it. 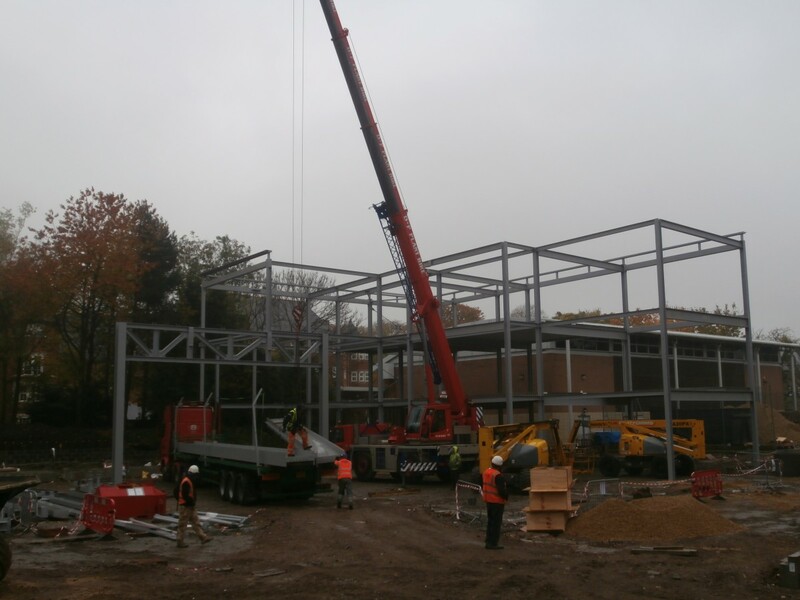 Although only a small section of the steel frame had been erected, enough was there for one to start to see the building’s shape already developing. The sides of the building facing Tankerville Terrace and the Sports Hall will be three storeys high and the back section visible from St Mary’s Court (formerly the Princess Mary Maternity Unit) will be only two storeys. This area is planned to be a roof garden. It is just possible to see the variation in height of the steel structure developing: 3 floors at front but only 2 at the rear. There were big changes to be seen to my left today too. In the intervening week, the single-storey kitchen area of the Church High old building must have been demolished and new foundations were in the process of being prepared. 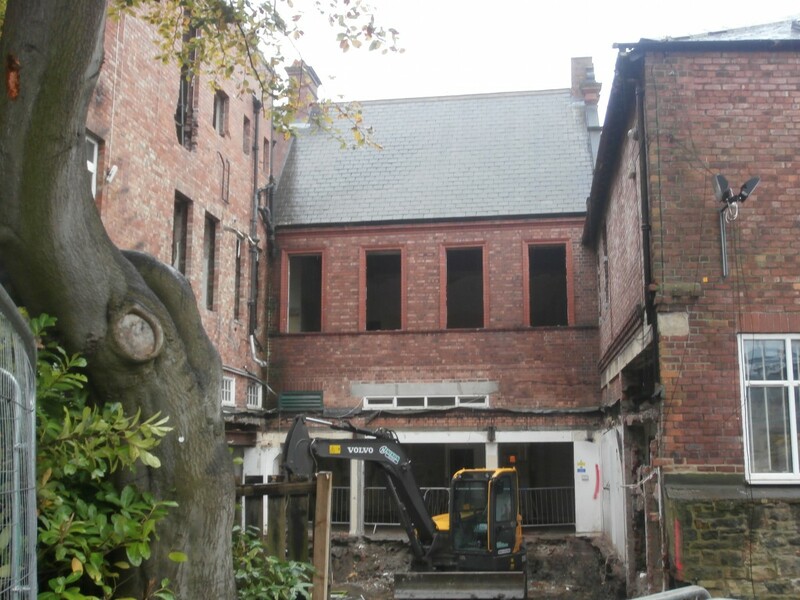 A new three-storey, glass-fronted extension is planned for this space. 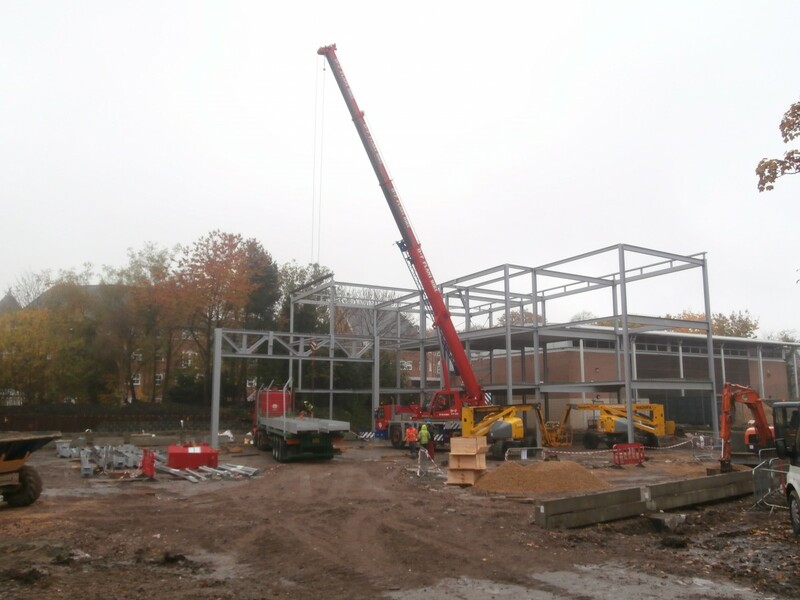 This circulation ‘shaft’ will provide access across to the new build in addition to housing the relocated main North staircase which Wates recently demolished. 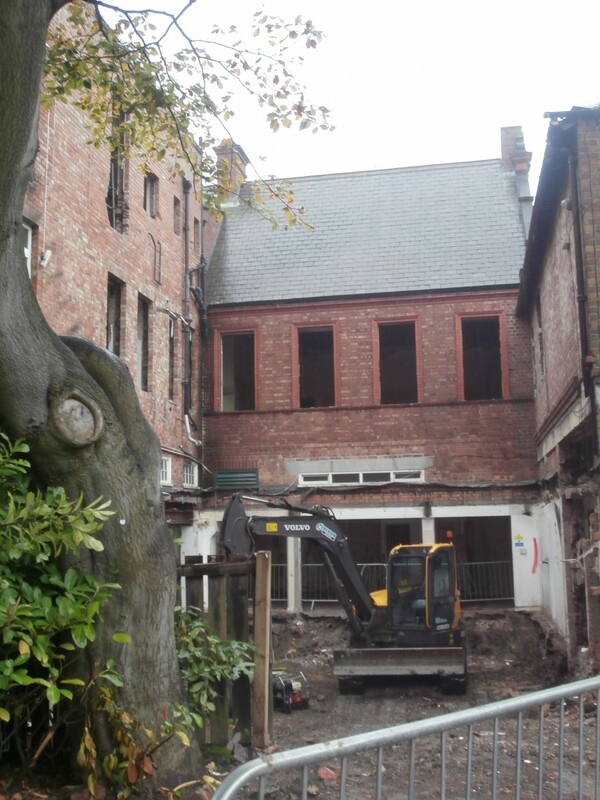 The single-storey section of the kitchen area has been demolished to make way for a new three-story, glass-fronted extension. Tantalising glimpses inside the Church High old building. The only constant in life is change, as we all know, but it is still hard to accept this sometimes. The new always will be built on the foundations of past things and, as a consequence of this, life goes on. But the past will always be there. To paraphrase the novelist LP Hartley, it is merely another country where people did things differently. Words written straight from the heart, Christine. It’s plain to see you love this place. You are ‘spot-on’ in your description, Emma, as always! Interesting and also sad, but the only certain thing in life is Change and this change allows us all to move on and ‘future-proofs’ a beautiful building which I think is the important thing. Glad to know you’re ‘on the journey’ with us. It’s a big year!